I made this photo today after watching Oregon defeat South Florida today in the El Paso Sun Bowl, 56-21. 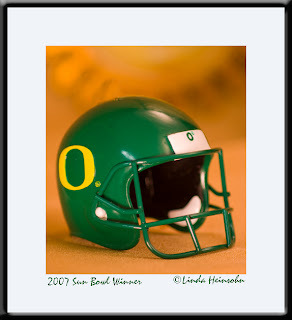 I used my UO football helmet Christmas ornament, my Rebel xT with macro lens and a sun pendant for the background. It's corny I know, but it's the first photo creation I've made in this predetermined, set-up way for probably more than a year! Thanks go to the Ducks for inspiration as well as to my friends on Carol Leigh's photo alumni group for encouragement, stimulation, and for providing great examples to follow and new techniques to try.